There are always things we want on our craft supplies wishlist…and even when you have as much crafting crap as I have, you still want/need/dontreallyneedbutreallywant MORE. And the thing holding us back? Money, am I right? Well what if I told you you could get a great deal on some of your most coveted crafting/quilting/sewing supplies? Interested? You may have heard of Massdrop.com. They organize groupbuys for different online communities. The way a groupbuy works is that a bunch of people vote on what they want to buy, and then Massdrop negotiates with the company and orders it in bulk. They then pass on the discounts to the group. The best part is that the more people that join the buy, the bigger the discount gets! They started by giving group discounts on various electronic items and games but now they are getting into the crafting and quilting niche so we need to get the word out so we can all get some great deals! Right now they are having deals like 3 Moda Jelly Rolls for $28 per roll–normally $38 (and these are RARELY on sale!) If 25 people buy them, the price goes down to $24.50! So okay, on to the giveaway right? Do you wanna win a Moda jelly roll? 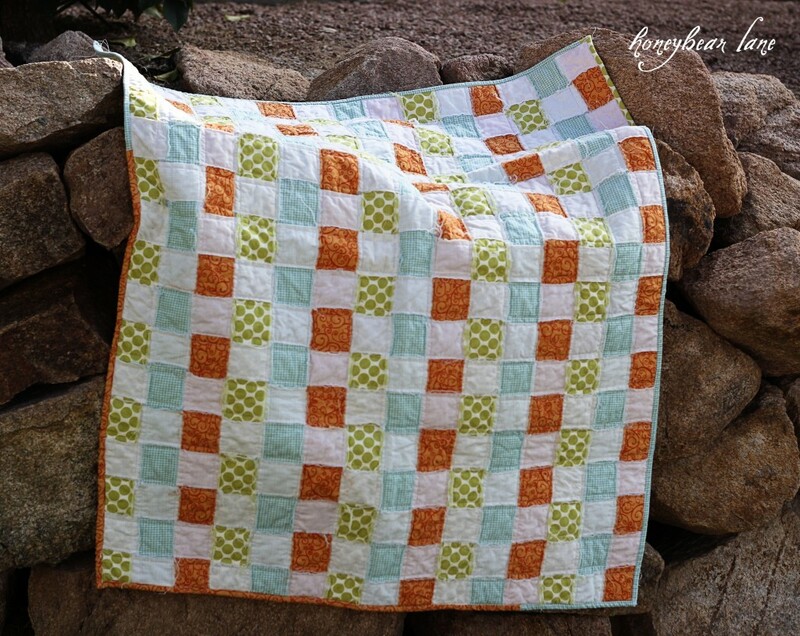 I love these things…and you can make cute quilts like my basketweave quilt with them! Today Massdrop is giving away three jelly rolls from the following collections: Oink a Doodle Moo! by Jenn Ski, Glamping by MaryJane, and Kissing Booth by basicgrey. Moda jelly rolls sell out super fast so these are hot items! Three winners so enter! Disclosure: The post was written on behalf of massdrop.com, all opinions are 100% my own. I love jelly rolls and use them all the time for pillows, table runners, wall hangings and quilts. a small quilt or placemats or even a window covering. 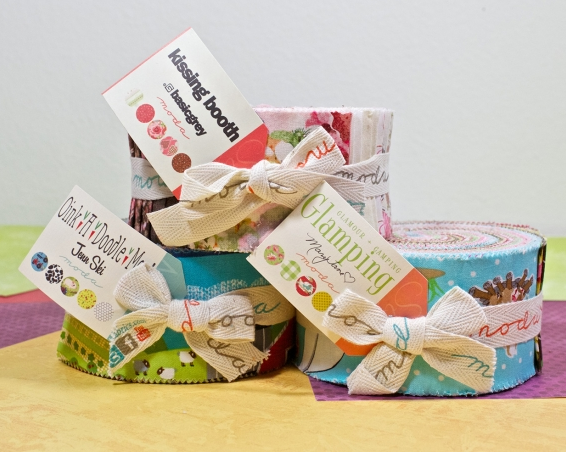 I’ve never used a jelly roll before so it would be lovely to win these! We really need a table runner! HELLO! I’D MAKE A QUILT+MATCHING PILLOWS! I would make a quilt to have picnics on this summer! Oh I love glamping!! I would make a quilt using Rachel Griffith’s Flip Side quilt pattern! I would make a camera strap and some bedspreads for doll babies. I look at them often but have never actually bought a jelly roll! Sew some together and then make a bag, use the rest in a lap quilt. A quilt for my new nephew or skirts for my little lady! A baby gift…maybe burp cloths. I would likely try to make a table runner and a tote bag (or two) with my jelly roll! a onesie dress for my niece coming soon 🙂 and matching burp cloths! SO simple to make, but super adorable! This is the coolest idea ever – I might have a hard time justifying not buying all the great deals! I would like to make a picnic quilt, since the kiddos and I will be spending a lot of time outdoors this summer! I’d love to see fabrics and notions in Massdrop! I’d love to make a lap quilt! Popular fabrics and scrapbooking sundries! I would make a small quilt for my cat Sable Baby. I would like to see more fabrics, yarns and scrap booking supplies. Thanks for the giveaway. Fabric, fabric, and fabric shop gift certificates. My daughter’s 1st Birthday is coming up, so I would make her a special mommy quilt. Fabric, floral type crafts and ribbons. Good Quality Wool Felt in bundles would be awesome! Thanks!!! I would like to see more fabric offers!! I’d love to see washi tape again! i’d like to see more fabric options… and maybe cutters and mats? bulk button or trim packages… that kind of thing. Cool site! Bring on the deals! I would make a postage stamp quilt with one of these lovely jelly fools. Tanks for the chance to win. I would make a postage stamp quilt with one of these lovely jelly rolls. Thanks for the chance to win. The fabric is a fun option on Massdrop! I would be interested in seeing Washi Tape or Baker’s Twine offered. I don’t think a crafter can have too much of either! I would love some of the Glamping fabric to make my granddaugter a quilt. I’d like to see fabric bundles and jewelry making supplies. I love the fabric options. Fabric is so expensive, so I’m always looking for ways to buy it in expensively!! I have used them many times this would make a lovely wedding gift. Love this. I would use the fabric to make a fun quilt. I would like to see half & whole yards of fabric, Cricut cartridges, ribbon/sewing trims. Thanks for this great lead to what looks to be an awesome site!! 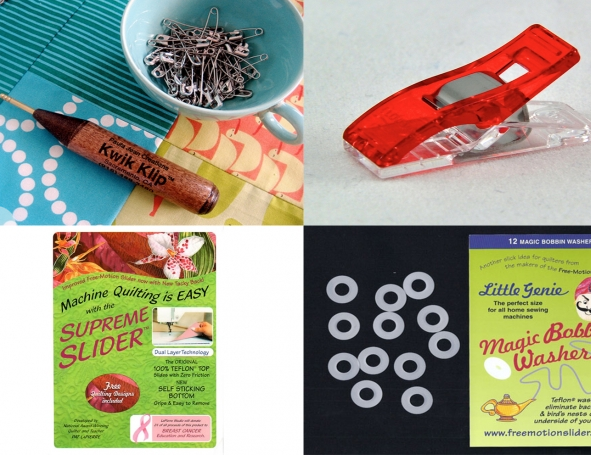 Love Fabric, Fabric, Fabric – precuts are great, also like Sizzix Dies. Thanks for the giveaway and inviting us to MassDrop. Cute jelly rolls! Thanks for the giveaway. I love crafting of all kinds, so I’m happy to see any kind of crafting materials. Thanks for a great giveaway! I would love to see more fabrics to get some great deals! I love this its a diy co op! The concept of precut coordinating strips is most enticing!